Undertale is out on Switch today. It took three years for the excellent JRPG-inspired adventure to finally arrive on a Nintendo console. Now it has and, despite the sometimes clumsy Joy-Con controls, the game feels like it’s come home. In Undertale you play as a kid who’s somehow ended up in the underground, a world that belongs to monsters, and has to find their way back to the surface. You can talk to the monsters, fight the monsters, or try to become friends with them. What you choose to do in any given situation can have consequences that cascade throughout the rest of the game. Add to that a story and characters that balance morbid tragedy and comic absurdity and you arrive at the magical alchemy that makes Undertale tick. Core to its appeal is the game’s aggressive subversion of classic video game rules, chief among them the idea that might makes right and the player is a god-like figure not to be messed with. On its surface Undertale feels like a middle finger to the naivete of early Nintendo games, yet underneath feels like a love letter to these classics. When creator Toby Fox sent his creation out into the world in 2015 it felt like a revelation, the rare game that managed to marry high concept writing and themes with compelling mechanics. It was the full package, one whose third act reversals, multiple endings, and attention to detail made it continually worth revisiting, not unlike another cult classic that inspired it: Earthbound. Fox has confessed to making Earthbound ROM hacks while he was in high school, and Undertale, with its intimate, authentically human feel, seems like the obvious culmination of tinkering around under the hood of that masterpiece. The Switch doesn’t have Earthbound, but now it has Undertale. I’ve played Undertale on PC, and last year on PS4 and Vita (thank you cross-buy). On Switch, wedged between portraits for new Mario and Zelda games, it feels like a natural member of the family. Playing Undertale on Switch in 2018 reminds me of playing Earthbound on my brother’s SNES in 1994. The Switch edition feels definitive for several reasons. The latest port includes a small but recognizable new piece of art in one section that die-hard fans of the game will enjoy. It also has an additional boss battle that’s hard but extremely fun, especially in the context of the rest of the game’s story and lore. Fox hasn’t said if this easter egg and boss will be added to the other versions of the game, so for now if you’re hungry for something else to discover in Undertale, the Switch version is your only choice. That’s not to say that there aren’t some frustrations. Undertale, particularly when played on hard or aiming for a pacifist ending, can be surprisingly challenging, and the Switch’s Joy-Con thumb sticks and lack of a D-Pad do it no favors in the twitchier boss encounters. As perfect a game for playing in your lap as Undertale is, there were more than a few occasions when I wanted to play docked with a Pro controller instead. That’s more a failing of the hardware than the game, and isn’t a reason not to check out Undertale on Switch, especially for those who never tried it on the first few go arounds. 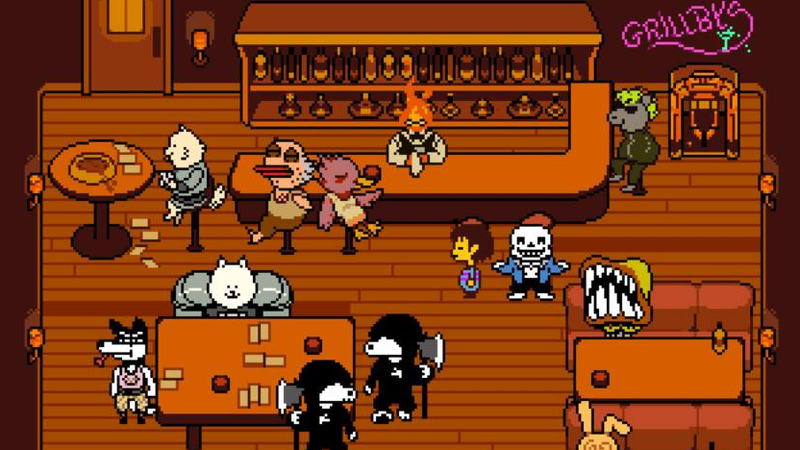 Undertale has quickly become a classic, and now it rivals anything else you’ll find on a Nintendo console.